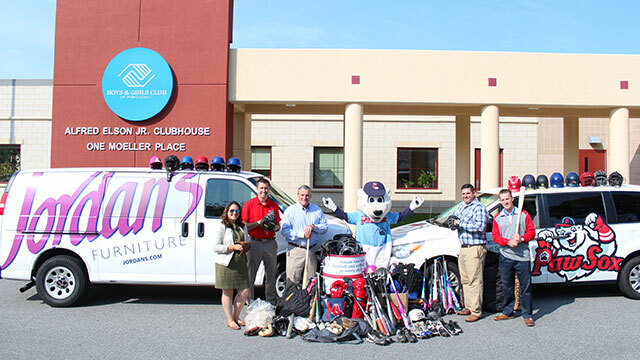 For the fourth year in a row, the PawSox teamed up with Jordan’s furniture and collected new/used baseball equipment during the 2017 season to benefit aspiring young baseball players at the Boys & Girls Club of Pawtucket. At every home game, fans were invited to donate equipment in red barrels that were located directly inside the Main Gate at McCoy Stadium. This season the barrels filled up quicker than ever, and the PawSox were able to donate more equipment than they ever have to the Boys & Girls Club of Pawtucket. The PawSox would like to thank our fans who came out to the ballpark this season and made a difference for our local youth. WINSTON-SALEM, N.C. (Sept. 13, 2017) – The Winston-Salem Dash are teaming with former Dash outfielder CJ Beatty to hold a Fall Baseball Camp at BB&T Ballpark on Saturday, October 14. Players ages 5-12 will work on basic fundamentals with Beatty, who will also hold discussions with players on mental skills and parents on future planning throughout the event. Check in is set for 8 a.m., with camp running from 8:30 a.m. to Noon. Call (336) 714-6865 to secure your child’s spot in this exciting camp, which costs just $50 per person. The Fall Baseball Camp is a rain or shine event. Beatty is a native of Winston-Salem and an alumnus of North Carolina A&T State University, where he majored in Business and catapulted his baseball career. He was selected in the 2009 Major League Baseball Draft by the St. Louis Cardinals. In 2014, Beatty joined the Chicago White Sox organization and played for the Dash in both 2014 and 2015. Beatty is an international speaker who specializes in teaching people to believe in themselves when nobody else believes in them. Since 2009, he has traveled around the country and Australia hosting baseball camps, holding baseball workshops and delivering powerful messages. People have dubbed him as “The Baseball Motivator.” His YouTube channel has nearly two million views and has reached people in more than 220 countries. Fans can follow Beatty on various social media channels at cjbeatty44. LAKEWOOD, NJ – The BlueClaws will host a special Wellness with the BlueClaws clinic at FirstEnergy Park on Thursday, August 31st from 10 am until 12 pm. The BlueClaws are the Jersey Shore’s top stop for affordable, family entertainment. They have led the South Atlantic League and New Jersey in average or overall attendance in all 16 years of existence. KANNAPOLIS, N.C. (May 30, 2017) – The Kannapolis Intimidators will take part in Minor League Baseball’s Cover Your Bases initiative to promote sun safety awareness this Sunday, June 4, when the Intimidators take on the Greensboro Grasshoppers at Intimidators Stadium supported by Carolinas HealthCare System at 5:05 p.m. Gates open at 4:00 p.m., and the first 1,000 fans will receive a sample of Blue Lizard sunscreen as the Intimidators and Minor League Baseball team up with the American Cancer Society to educate fans about the danger of skin cancer. Cover Your Bases, a partnership between MiLB and the American Cancer Society, will provide 75,000 free samples of sunscreen to Minor League fans at over 80 different ballparks this summer. The Intimidators, along with dozens of other MiLB teams will work to educate fans about the measures they can take to reduce the risks of cancerous developments and overexposure to UV rays. • Protect your skin with clothing: When you are out in the sun, wear clothing to cover your skin. Long-sleeved shirts, long pants, or long skirts cover the most skin and are the most protective. A tightly woven fabric protects better than loosely woven clothing. If you can see light through a fabric, UV rays can get through, too. • Wear a hat: A hat with at least a 2- to 3-inch brim all around is ideal because it protects areas that are often exposed to intense sun, such as the ears, eyes, forehead, nose, and scalp. • Use sunscreen: Use an SPF 30 or higher broad spectrum sunscreen. Ideally, about one ounce, about a shot glass or palmful, should be used to cover the arms, legs, neck, and face of the average adult. Sunscreen needs to be reapplied at least every two hours to maintain protection. Sunday is a Bark in the Park game as well as Kid’s Day, featuring a pregame autograph session with several Intimidators’ players, and postgame kids run the bases. First pitch is scheduled for 5:05 p.m. Tickets are available by calling the F&M Bank Box Office at (704) 932-3267, or by visiting Intimidatorsbaseball.com. SALT LAKE CITY (May 8, 2017) – On Tuesday, May 9, the Salt Lake Bees and the Utah State Office of Education will host more than 12,000 students for Prevention Dimensions Kids Day, with free admission courtesy of Med One Capital and Questar. The Bees will face the Omaha Storm Chasers at 10:35 a.m. at Smith’s Ballpark. The fifth and sixth grade students attending the 15th annual event will be treated to an on field opening ceremony where Bees General Manager Marc Amicone will declare the day as Prevention Dimensions Kids Day in Utah, which promotes drug and alcohol prevention. The National Anthem will be sung by Vienna Wolfgram, while a flag presentation will feature children from Eagle Bay Elementary, Lake Ridge Elementary School, Newman Elementary School, Nibley Elementary School, and Antelope Elementary School. Attendees are also encouraged to bring a canned food donation for the Utah Food Bank as part of the program. Prevention Dimensions is Utah’s Safe and Drug-Free Schools and Communities curriculum, which supports the Utah State Office of Education pre-kindergarten through 12th grade health core. The program strives to give students a strong foundation of effective violence and substance abuse prevention skills. The program began in 1982 as a joint effort between the Utah State Division of Substance Abuse, Utah State Department of Health, Utah State Office of Education and Utah State PTA. Prevention Dimensions Kids Day is part of the Bees organization’s ongoing commitment to community outreach, health and wellness and youth development. GRAND CHUTE, WI – Elite Smiles Dental and the Wisconsin Timber Rattlers want your children to have healthy teeth and gums. That is why they are asking children 12 years of age and younger to take the Oral Health Challenge. Each participant who successfully completes the challenge will receive two free tickets to a Timber Rattlers game. Once a participant has turned in a completed form, the participant will receive two reserved seat tickets to one of four Oral Health Days at Neuroscience Group Field at Fox Cities Stadium. Those days are Thursday, May 18; Monday, June 12; Monday, July 24; and Tuesday, August 8. Completed forms will be accepted until August 1, 2017. Challengers may also want to come to the game on Friday, June 9 when the Rattlers and Elite Smiles Dental will be giving away a toothbrush holder to the first 1,000 fans. Game time is 7:05pm. Partial season and group ticket packages are currently available for the 2017 season. Tickets packages are available online, over the phone at (920) 733-4152 or (800) WI-TIMBER, and in person. Individual game tickets for this season are also on sale now. Groups of 20 or more may order tickets over the phone or in person. The Neuroscience Group Field at Fox Cities Stadium Box Office is open from 9:00 am until 5:00 pm Monday through Friday and from 10:00am to 3:00pm on Saturdays. Peninsula Regional Medical Center (PRMC) would like to extend its thanks and gratitude to 3,142 people on Delmarva who were vaccinated against the flu during the Medical Center’s 2016 Drive-Thru Flu Clinic on October 13 at Arthur W. Perdue Stadium. PRMC appreciates the community making sure they “live well” through annual vaccinations against the flu. We also thank the Delmarva Shorebirds for our long-standing partnership and the use of the ballpark to host the Medical Center’s largest and best attended annual community healthcare event. (Fort Mill, SC) — The Charlotte Knights and Carolinas HealthCare System (CHS) will host their fifth annual health fair this Friday, May 31st at Knights Stadium. Fans will have the chance to visit with medical experts from multiple facilities in the area on topics of health, wellness, fitness and lifestyle improvements. The health fair is free with a ticket to that night’s game. 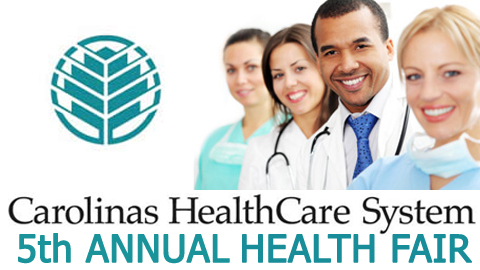 Medical experts will be on-site to answer questions and provide general health information and giveaways for attendees. Over the past four years, CHS and the Charlotte Knights have worked together to educate more than 36,400 fans at Knights Stadium on preventative medical practices. Friday’s game also features a retro baseball card set giveaway to the first 1,000 fans and the Knights will wear their 1990 “throwback” jerseys. Gates are set to open at 6:00 p.m. as the Knights host the Rochester Red Wings in game one of an exciting four-game series. First pitch at Knights Stadium is scheduled for 7:15 p.m.
Carolinas HealthCare System, one of the nation’s leading and most innovative healthcare organizations, provides a full spectrum of healthcare and wellness programs throughout North and South Carolina. Its diverse network of care locations include academic medical centers, hospitals, healthcare pavilions, physician practices, destination centers, surgical and rehabilitation centers, home health agencies, nursing homes and hospice and palliative care. CHS works to improve and enhance the overall health and wellbeing of its communities through high quality patient care, education and research programs, and numerous collaborative partnerships and initiatives. Tickets for Friday’s game are available at the Knights Ticket Office located at Knights Stadium, online at www.charlotteknights.com, or by phone at 704-357-8071. Knights Baseball… Tradition Never Ends. This article originally appeared on the official website of the Charlotte Knights. Click here to view the original story. SPRINGDALE, Ark. – The Naturals return for a brief three-game homestand on Saturday, but Strike will be a busy Sasquatch over the next six days, making 11 appearances in five Northwest Arkansas communities as well as welcoming the Naturals back to town. Wednesday, May 15: Strike will visit patients at Circle of Life Hospice in Springdale, lifting their spirits and generating smiles. After his visit to Circle of Life, Strike will have lunch with a special group of youngsters who were selected as part of the Terrific Kids program sponsored by the Bentonville Kiwanis club. Thursday, May 16: Strike will have lunch with Terrific Kids selected by the Bentonville Kiwanis Club. Friday, May 17: Strike begins his Friday by visiting students at Bright Field Middle School in Bentonville, followed by a trip to Mathias Elementary in Rogers. At both schools, Strike will congratulate students on a successful school year and promote their upcoming fundraising nights at Arvest Ballpark. Later in the day, Strike will make an appearance with participants in a study conducted by the University of Arkansas Psychology department. Strike will close out the day by supporting runners and walkers in Bella Vista at the Strides for Stroke 5K and 1-mile fun run. Saturday, May 18: Strike will start his Saturday morning with a visit to the Wildcat Rumble 5k in Bentonville. After passing out awards and celebrating with the winners, Strike will visit the Compassion House in Springdale. Following a brief lunch break, Strike will head over to Pinnacle Hills Mall in Rogers to take part in the rescheduled Touch-A-Truck event, benefitting the Junior League of Northwest Arkansas. Later in the day, Strike will appear the Bentonville Great Strides event for the Cystic Fibrosis Foundation. In addition to Strike’s visits around Northwest Arkansas, the Naturals will welcome eight groups to Arvest Ballpark this homestand as part of the team’s fundraising program. These groups include Elkins Elementary School, Sugar Creek Elementary School, Lincoln Junior High School, Huntsville Intermediate School, Mathias Elementary School music department, Lowell Elementary School, Aid for Developing Countries and Western Arkansas Child Development. As of May 14, the Naturals ticket fundraising program has raised $52,543 this season. If you would like to have Strike appear at your event, email streetteam@nwanaturals.com or fill out the form on the Naturals’ website, located by clicking on the Community tab at the top of the webpage, then clicking the appearances link. Those interested in participated in the Naturals ticket fundraising program should call 479-927-4900 or email groups@nwanaturals.com. The Northwest Arkansas Naturals are the Double-A Texas League Affiliate of the Kansas City Royals and proud host of the 77th Annual Texas League All Star Game. The Naturals play at state-of-the-art Arvest Ballpark in Springdale, AR. For more information including statistics, ticket options, and more, please visit NWANaturals.com, and follow us on Twitter @NWANaturals and Facebook.com/Naturals. The State College Spikes have announced the team’s roster of 2013 school programs. Each program has a unique theme and focus, but the common goal is to use the fun Spikes brand to supplement classroom curriculum in the areas of reading, writing, exercising, eating healthy and living an eco-friendly lifestyle. Most programs are supplemented by school assemblies involving mascots, players and front office staff, and all programs offer K-8 students the opportunity to earn free tickets and experiences at Spikes home games upon completion of fun program tasks. 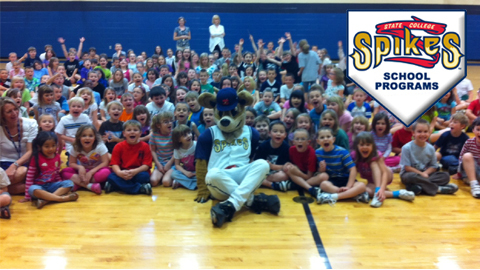 Last year, the Spikes reached over 15,000 Central PA school children in Centre, Clearfield, Clinton, Huntingdon, Mifflin and Juniata Counties. The Spikes and Mount Nittany Health are offering this school program, which is designed to promote a healthy lifestyle through nutrition and physical activity. Ike the Spike and representatives from Mount Nittany Health will visit schools to hold a kick-off assembly (which can be held outside or inside). During the assembly, K-6 students will be educated on the importance exercise and nutrition before having the opportunity to take “Ike’s Fun Fit Challenge.” Students who complete the simple and fun physical fitness challenge will be rewarded with one complimentary Bullpen Box ticket and an on-field recognition ceremony during the Spikes’ Healthy Home Runs Day at Medlar Field at Lubrano Park on Saturday, August 3, 2013. Project I.K.E. is a collaboration between the Spikes and Centre County Recycling and Refuse Authority teaching children about the importance of “going green” and incorporating eco-friendly practices in their daily lives. The acronym in the program title stands for “Inspiring Kids to be Eco-Friendly” and targets children in grades K-8. The Spikes, Ike the Spike and a representative from the Centre County Recycling and Refuse Authority will host educational school assembly visits for each participating school. Project I.K.E. also offers complimentary tours of Medlar Field at Lubrano Park, which demonstrates how the Spikes recycle and go green in the world’s first LEED Certified (Leadership in Energy and Environmental Design) ballpark. As part of the program, students will be given an educational packet to complete, which can be redeemed for one complimentary Bullpen Box Ticket to a 2013 Spikes home game. In partnership with Chick-fil-A and the Pennsylvania State Education Association (PSEA), the Spikes Student All-Stars program provides K-8 teachers around the region with a tool to reward students with free tickets to a Spikes game based on whatever criteria the teacher would like to establish in his/her own classroom. Each teacher within the Spikes geographic region receives six (6) forms to distribute to students. The program encourages teachers to incentivize students based on excellence in a subject, dramatic improvement in a subject, or by showing classroom leadership. Any student chosen will be provided with a free ticket to one of three pre-determined 2013 Spikes home games (July 7, August 4 and August 25), and will be honored as part of a special pre-game, on-field recognition ceremony. The Spikes and National Penn Bank have partnered for the Books and Baseball reading program for the 2013 season. This program encourages students to complete a reading program by rewarding them with free Spikes tickets upon completion. Participating students will receive a special bookmark to keep track of the books they read. Any participating student that reads four books under the supervision of their teacher or parent will earn one free ticket for a designated Books and Baseball game during the 2013 season (July 6, July 27 and August 24). At those games, participants will be honored from the field for their participation and completion of the programs. The program includes a free assembly and reading presentation with the National Penn Bank Nook Monster at any of the participating schools. Books and Baseball is designed for students in grades K-8. The Spikes Essay Contest is for K-8 students to creatively share their experiences and thoughts about the State College Spikes through pictures or essays. The contest is divided into three different grade levels: K-1, 2-4 and 5-8. Students in kindergarten through first grade are encouraged to include drawings along with one sentence for the theme “If I were Ike the Spike.” The second to fourth grade group will be asked to write a short essay entitled “If I coached the Spikes.” Fifth to eighth graders will be encouraged to write a 300 or less word essay entitled “If I could create a new food item for the Spikes, it would be (blank).” A winning essay will be chosen in each of the three age groups and those winners will earn tickets to a 2013 Spikes home game for their entire grade. The submission deadline for the Spikes Essay Contest is June 1. There is no cost for school to participate in any 2013 Spikes school program. Teachers or administrators interested in participating in any of the State College Spikes school programs can contact Spikes Community Relations Manager David Wells at 814-272-1711 ext. 331 or dwells@statecollegespikes.com. The Spikes, the Class-A Short-Season affiliate of the St. Louis Cardinals, will open the club’s eighth season on Monday, June 17 at Medlar Field at Lubrano Park against the rival Williamsport Crosscutters (Philadelphia Phillies). The Spikes will be home for 38 regular season home dates between June 17 and August 30. Single-game tickets for the upcoming 2013 season will go on sale to the public starting Friday, April 26 at 4 p.m. Season Tickets, Value Plans, McDonald’s Flex Books and an array of group and corporate hospitality options are currently available and can be reserved by calling (814) 272-1711. All Spikes ticket options can be viewed at State College Spikes.com. LAKEWOOD, NJ – As a nutrition-conscious America looks for more healthy menu options when dining out, Horizon Blue Cross Blue Shield of New Jersey and the Lakewood BlueClaws are teaming up to bring smarter eating choices to America’s pastime. 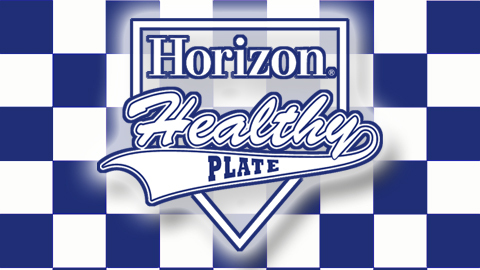 Just in time for the BlueClaws 2013 baseball season, Horizon BCBSNJ is opening a new “Horizon Healthy Plate” concession stand at FirstEnergy Park, where fans at every game will be able to find nutritious alternatives to the traditional ball park fare. “Good food and family fun are the great staples of a professional baseball game at any of New Jersey’s Minor League ballparks,” said Jonathan Pearson, Director of Corporate Philanthropy and Community Affairs for Horizon BCBSNJ. “Healthy eating should be a part of the ballpark experience, too. That’s why Horizon BCBSNJ’s pitch to fans is to bring their appetites to the Horizon Healthy Plate concession, where menu options are both nutritious and delicious,” Pearson said. The Horizon Healthy Plate concession has received the support of the New Jersey Department of Health, which administers ShapingNJ, a public/private partnership for nutrition, physical activity and obesity prevention. The BlueClaws and Horizon BCBSNJ will officially open the Horizon Healthy Plate concession stand on Thursday night with a ceremony at 5:45 pm, before the 6:35 pm game. 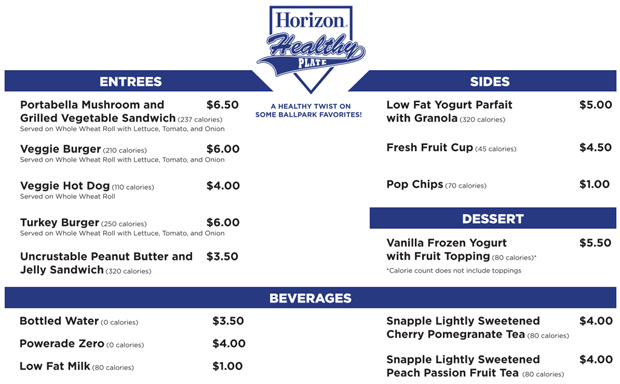 The Horizon Healthy Plate menu was designed by certified dieticians under the direction of Glenn D. Pomerantz, MD, JD, Vice President and Chief Medical Officer of Horizon BCBSNJ. The menu includes a long list of popular heart-healthy dining choices, such as a grilled vegetable sandwich, a turkey burger, and frozen yogurt topped with fruit. The Horizon Healthy Plate menu also includes nutritional alternatives to the traditional ballpark fare, such as a veggie burger, a veggie hot dog and pop chips. From entrees to appetizers; from side dishes to beverages; each affordably-priced item includes calorie and other nutritional information. Horizon Blue Cross Blue Shield of New Jersey, the state’s oldest and largest health insurer, is a tax-paying, not-for-profit health services corporation, providing a wide array of medical, dental, and prescription insurance products and services. Horizon BCBSNJ is an independent licensee of the Blue Cross Blue Shield Association, serving 3.6 million members with headquarters in Newark and offices in Wall, Mt. Laurel, and West Trenton. Learn more at www.HorizonBlue.com. The BlueClaws are the Jersey Shore’s top stop for affordable, family entertainment. They have led the South Atlantic League in attendance in all 12 years of existence.